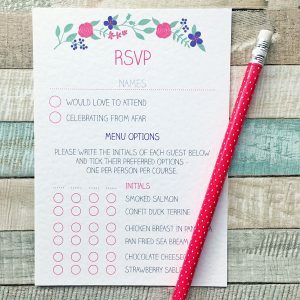 Looking for RSVP cards for menu options? If you order wedding invitations from The Leaf Press, all invitations that include an RSVP – that’s all of them except evening wedding invitations – can have menu choices added to the RSVP at no extra cost. This enables you find out from guests whether they are attending, as well as what they’d like to eat, all on one card – hopefully minimising the chances of guests forgetting to tell you this information! Here is an example of an RSVP card with space for menu options. An RSVP card like this comes with all A5 flat card wedding invitations. Booklet wedding invitations include an RSVP page which can also be adapted to include menu options. In this example there is space for up to four people to write their menu preferences, with two options for each course. 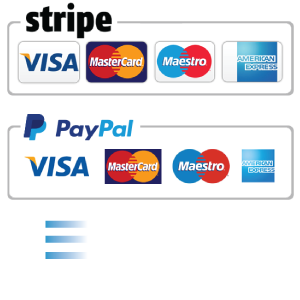 There is some flexibility with how many people and how many options per course can be fitted on to the card – space permitting of course! With ticket wedding invitations the space in the RSVP section is more limited, but there is usually room for basic menu options for up to two people. As can be seen in the above example, each menu item is listed, but in abbreviated form. If you would like your guests to see the full menu in order to make their choices, you may choose to order an information card for A5 invitations, or an extra insert sheet for booklet invitations. If you are deciding on the best format for your wedding invitations, or have questions about RSVP cards for menu options, please don’t hesitate to contact The Leaf Press for further information. Alternative, please visit the A5 invitations with RSVP and Booklet wedding invitations sections to view designs for invitations with an RSVP included.